Building Control system, including an increased role for self-certification schemes. * Replacing the currently-referenced standards in Part A (Structure) with the new British Standards based on Eurocodes * Aligning the existing guidance in Approved Document C (Site preparation and resistance to contaminants and moisture) with the most up-to-date radon maps to ensure the safety provisions are targeted appropriately * Wholesale revision of Part L (Conservation of fuel and power) to reduce carbon dioxide emissions further. * Clarifying the guidance on Access Statements in Approved Document M (Access to and use of buildings) * Rationalising the guidance supporting Parts M, K and N (Access, Protection from falling, collision and impact and Glazing respectively) to remove unnecessary costs on business * Making changes to the technical guidance in Approved Document B (Fire safety) to resolve practical problems in the application of Requirement B2 (Internal fire spread (linings)) * Setting out the intention to take forward the repeal of the fire protection provisions in the Local Acts * Setting out the non-regulatory approach proposed in relation to domestic security and Changing Places toilets. Written to save time for hard-pressed users, the uncluttered and user-friendly layout of the Guide allows the essential facts to be assimilated quickly and enables readers to navigate easily from section to section. 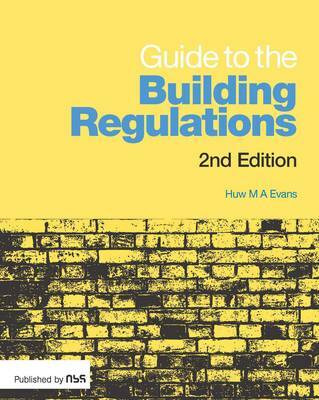 This new edition of Guide to the Building Regulations will be a welcome companion for architects, construction professionals and building control officers alike.